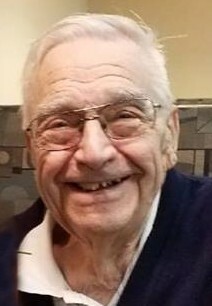 Obituary for James W. "Jim" Greenwell | Hunter Funeral Home, Inc.
James W. “Jim” Greenwell, 93, of Quincy formerly of Mendon passed away on Wednesday, July 11, 2018 in the Illinois Veterans Home in Quincy. Jim was born on November 9, 1924 in Cooperstown to the late Gilbert Wesley and Alice (Kiefer) Greenwell. He married Nellie A. Wells on July 11, 1945 in Mt. Sterling. Nellie passed away on August 29, 2011. Jim served his country during WWII in the Army Air Corps. He was awarded the American Campaign Medal, European African Middle Eastern Campaign Medal with two bronze Battle Stars, Good Conduct Medal and the WWII Victory Medal.He retired in 1988 as an insurance agent for Country Companies Insurance Company. He was a member of the Ursa Christian Church, Mendon Masonic Lodge #449 and the Bear Creek American Legion. He loved to play golf, go fishing, camping and loved going to Florida to visit his extended family. Surviving are; Doug (Karen) Greenwell of Quincy; grandchildren, Jennifer Brown of St.Peters, Mo., Bettsy (Matt) Leutkemeyer of Jefferson City, Mo., Gary (Dawn) Klossing of Republic, Mo., Kelly (Jared) McGriff-Culver of Downers Grove, Luke (Sarah) Greenwell of Bolingbrook, Josh (Kaleena) Greenwell of Blue Springs, Mo. ; great-grandchildren, Nicholas Brown, Wesley, Jacob and Maggie Leutkemeyer, Madisyn, Molly, Mylee and McKaelyn Klossing, Corin Greenwell, Donovan Humphrey, Jayce McGriff-Culver, Harper and Emmett Greenwell, Rylee Greenwell; Sister-in-law, Faye Greenwell of Quincy, one nephew, Randy Greenwell of Quincy and one niece, Lynn Barton of Belvider. He was preceded in death by a daughter, Rita Klossing, two brothers, Clarence and William Greenwell and two special nephews, Tom and Bud Burrows.